Music has always played a big part in the city's history. Even before it became a city, Galax was producing Appalachian string musicians - and it continues that proud tradition 100 years later, highlighting that heritage now through the Galax Old Fiddlers' Convention, the Leaf & String Festival and the Blue Ridge Music Center. The area was already rife with musicians when the city was founded in 1906. Historians point to Greenberry Leonard, who lived from 1810 to 1892, as the source for much of the fiddle music that came later. The Leonards moved into the Chestnut Creek area (now Galax) from North Carolina in the late 1700s. Green Leonard got a marriage license in Grayson in 1833 and lived in the Oldtown section. Tunes like "Waves on the Ocean," "Forky Deer," "Piney Woods Girls," "Sheep Shell Corn," "Flatwoods" and "Highlanders Farewell." them not because of their antiquity bur because they're good tunes. Tunes that could last a couple of centuries. "Some of the music has been here longer than Galax." Lundy wasn't the first local musician to be recorded, but he is among the earliest Galax musicians whose careers extended into the era of recording. Emmett W. Lundy' was born May 9, 1864, to Churchwell and Caroline Ward Lundy, one of nine children, according to the liner notes from the out-of-print record "Emmett W. Lundy, Fiddle Tunes from Grayson County." His great-grandfather John Lundy moved to the Delhart section of Grayson County in 1787. Emmett Lundy died in 1953. His daughter, Elva, told music historian Kevin Donleavy: "Dad told Kelly that he'd go to Green Leonard's house when he was learning to play the fiddle, and that he rode a horse. On the horse he'd play the fiddle on the way back and that horse would keep time with the fiddle." Lundy told the Lomaxes he had to "catch" Leonard's tunes because Leonard always tried to hide the way he was playing from other fiddlers, if he saw them watching. "Green took great pride in being thought of as the best fiddler around," says musical historian Dale Morris of Elk Creek. "Later on in life, as Green was getting on up in years he told Emmett that he (Emmett) was the only one that was able to catch a lot of his tunes and do them right. Then he started showing him tunes, but Emmett was never able to learn them all before Green died." Lundy supported a family of 14 by blacksmithing, repairing watches and musical' instruments and pulling teeth - and played the fiddle after supper. He never drove a car. "He rode horseback," his daughter told Donleavy. "If he needed to get anywhere, he took the horses and wagon, an open wagon,"
Son Kelly, writing the liner notes to an album of his father's work, recalls he was a great orchardist and talented in grafting. "We raised everything we ate except for sugar, coffee, pepper and a few things like that. It was a simple life 'cause we always had plenty t.o eat, clothes to wear, shoes on our feet, a good roof .over our heads, lots of friends, and we were a happy bunch because most of the family members made some kind of music." According to Marty McGee, author of "Traditional Musicians of the Central Blue Ridge," Lundy influenced the playing of younger men such as Crockett Ward, Eck Dunford, and Da Costa Woltz, "Ward and Dunford, in fact, spent days at Lundy's home." Lundy made two commercial recordings in 1925, with his second-cousin Ernest Stoneman (1893- 1968), in New York, but didn't like the way they sounded and didn't record again until 16 years later, for the Library of Congress. His sons Kelly on guitar and Geedy on banjo accompanied him on these 1941 recordings. According to Wayne Martin's liner notes, "Although Leonard refused to teach other fiddlers his techniques or tunes, Lundy managed to 'catch' them nonetheless through careful observation. "Lundy was recognized by many of his peers as the best fiddler in Galax in his prime." "Charlie Higgins was known to often say, 'Now this is a tune I learned from Emmett Lundy, who was the best fiddler I ever heard.'" Whit Sizemore, a well-known fiddler and fiddle maker who lives in the Piper's Gap area., was especially fond of Kable Brewer's fiddling and is perhaps the most direct musical descendant of Green Leonard playing music in Galax today. "Emmett - and I'm sure Green Leonard's style of playing - reflects the older Galax style of playing - closer to the sound brought over from the British Isles." Lundy, too, played tunes that are a classic part of the Galax old-time tradition today - like "Ducks on the Millpond" "Sally Goodin" and "Cumberland Gap." Musicians from the 1970s and forward "have gone back and listened to [Lundy's] old recordings and tried to pick up on that as a source," says Morris, who has the entire "Round of the Heart of Old Galax" collection. Fiddlers like Kirk Sutphin and the late Greg Hooven of Galax consciously study people like Lundy, he says. Morris has a picture of himself holding Emmett Lundy's fiddle taken four or five years ago. "Jerry Lundy, one of Emmett's descendants, had it at the time. Jerry was a fine fiddler himself. He lived up in Maryland and he got Jerry Correll [who now lives in Elk Creek] interested in playing the fiddle. Emmett's fiddle was stolen soon after the day Jerry Correll and myself went to visit Jerry Lundy." Luther Davis (1887-1986) was another disciple. He would hang around the Lundy place; both to play music and to have Emmett grind his corn. According to McGee, Davis' first instrument was a harmonica, but as a youngster he set his sights on the banjo. He played banjo until at 15 he learned to play the fiddle. "His first fiddle was previously owned by a neighbor who had died of consumption." From August 1902 to 1935, Davis played in a band with Jim Blevins and Fred Wilson, traveling around Carroll, Grayson and Alleghany (N.C.) counties, performing at schools, dances and political rallies. He married in 1910, bought a farm, worked in a furniture factory and became an auctioneer. He was a deputy sheriff from 1935 to 1949.. He played little music from 1935 to the 1970s, when the Library of Congress's Archive of Folk Culture made some recordings of him. "The Old Time Way," released by Heritage Records in 1986 features Davis' fiddling. Bobby Patterson, well-known musician and music producer from the Pipers Gap area, remembers hearing Davis play music with his father, John Patterson. "I've got some cassettes of him playing the fiddle." In preparing the "Old Time Way" album, "we found a recording Alan Lomax made in 1941 - and it happened to have Luther crying a sale in the background."
. That bit of auctioneering made it on the album. Patterson says Davis mentioned Green Leonard as one of his influences, although he was only a child when Leonard died. Through Lundy, Davis and other fiddle players continued Leonard's original style. "They all played the same style - and that style is dead and gone now," says Patterson. A few - like Kirk Sutphin - have come close, through study. And Whit Sizemore is "a descendant of that style of fiddling, though he can't copy them right down to the letter." special touch that nobody else I heard had." ensemble playing fundamentally changed the way the fiddle was played. "What once had been free~ standing melody was now placed with the confines I of an instrument which could only produce a few chords. whenever he wishes. This cannot be done when two musicians are involved." Patterson goes through a list of musical descendants, starting at Green Leonard: Emmett Lundy, Charlie Higgins, Luther Davis, Roscoe Parrish, Friel Lowe, Bob Crawford, Parlie Parsons, John Patterson, and finally, Whit Sizemore. Luther Davis died in the evening of Sept. 16, 1986, five days past his 99th birthday. Alec "Uncle Eck" Dunford (1878-1953), was another central figure in the musical life of early Galax. Born in Carroll County, Dunford lived in a cabin, on Ballard's Branch, which still sits near the home of Oscar and Larmie Hall. . He was a professional photographer and member of the Ballard's Branch Bogtrotters. He recorded with both the Bogtrotters and Ernest Stoneman. On some of the recordings, "you get to hear him talk," says Wilson. "He has this wonderful word swallowing way of talking. "He had a sense of history about the songs and the music itself." "Eck visited Emmett [Lundy] often to learn tunes, and Eck was about the first proficient guitar player in and around Galax," says Morris. "He would bring his guitar and play tunes with Emmett." Dunford played fiddle for Ernest Stoneman in the mid- to late 1920s, and recorded solo songs and humorous monologues and skits for Victor, making him one of the first country music comedians. Like "My First Bicycle Ride" and "The Savingest Man On Earth" recorded in October -1927 in Atlanta. At the first-ever Galax Old Fiddlers' Convention on April 12, 1935, Dunford won the prize in "folk story" - and the Bogtrotters won the band contest. When Stoneman left Galax in 1932, DUnford took up with the Ward family and formed the Bogtrotters. He recorded for the Library of Congress and was a frequent performer at the fiddlers' convention from its beginning. The "Round the Heart of Old Galax" record collection features Dunford pictures on the covers all pictures from Pipers Gap, showing a dam and mill, a churchyard filled with people, and what looks to be a sawmill with several teams of oxen, and a little girl with a guitar and a man with a bowed dulcimer. "The term 'bogtrotter' was a pejorative for a person from Ireland," says Wilson. "Dunford's use of it was sardonic." The Bogtrotters played from 1934 to 1942, "when Eck 'and Crockett Ward decided they were too old to be professional musicians." Doc Whitfield Painter Davis (1889-1956) was a musician, physician and one of the founding fathers of the Galax Old'Fiddlers' Convention. He played Autoharp.and fiddle and "he made several fiddles," says Patterson. "Whit Sizemore's got two of 'em." Davis met with Herman Williams, B.B. Lineberry, Dr. R.C. Bowie, Charlie Martin, W.T. Miller and Paul Melton - all members of the then newly formed Moose Lodge, around a coal stove above the Matthews Hardware Store to explore a way to raise money for the new organization. Also present was non-Moose-member Walter Alderman, who had experience with brass bands. "At first, they talked about forming a brass band and putting on a concert, but Doc suggested a musical show with a contest - so they did that," Patterson says. That one event makes Davis one of the most influential musicians in Galax's history, considering how the Old Fiddlers' Convention has shaped the city since. .
"He helped emcee it. He also played." Davis was an active member of the Moose band - the Moose Melody Boys ....:. Which played for benefits and local shows, and once went to the National Folk Festival in Washington, D.C.
Davis was a member of the New Ballard's Branch Bogtrotters but like many turn-of-the-century musicians, played much less later in life. Davis' office was above Bolen's Drug Store. He later moved to a log house that still stands behind Anderson Audiology. His doctor's office was a small shed out back. In 1927, DaCosta Woltz (1891-1941), a musician and mayor of Galax, formed a band with his friends Frank Jenkins and .Ben Jarrell (father. of the well-known fiddler Tommy Jarrell) .and traveled to Richmond, -Ind., to record with Gennett, taking along 12-year-old Price Goodson, whom Wilson describes as a: "young hotshot mandolin player." He named the band the Southern Broadcasters. "He was a hustler, -because they hadn't done any broadcasting," says Wilson. It was their only recording session, but they recorded 18 "sides," with Jarrell on fiddle and Woltz and Jenkins playing banjos. Goodson and Jarrell did the singing. Goodson (1913-1947) later became an excellent fiddler and Galax's city attorney, but he died at age 33. He passed the bar at 19 and worked in the office of the mayor - his cousin, Woltz. You can still buy the complete recorded works of the Southern Broadcasters from County Sales in Floyd. The album is titled "Da Costa Woltz's Southern Broadcasters 1927-1929." "Though the records didn't sell much, everyone learned' their songs," says Wilson. The Broadcasters' versions of "The Yellow Rose of Texas" and "Sweet Sunny South" are still the ones most people play, for example. But, says, Wilson, "the Depression came along and wiped out everybody. "The number of people who made recordings from around here is astounding," Wilson says. Just out in the Pipers Gap, Coal Creek area, for example. "There's no big crossroads, but an amazing number of musicians." Wilson asked the late Greg Hooven about that when the fiddler was 17, and Hooven told him ,"It's because we like music better than football." "It was such a good answer," says Wilson. "There's this retrograde quality around Galax that I like. We like our music better than that other music. "There are people here who are proud of what's from here and have a sensitivity about it. It has roots that go back to the meeting of the fiddle and banjo in early colonial America. It has a stubborn streak in it. .. It comes from close to the heart. "It endures, I think, because it does have quality to it. "People who can really hear music - people who hear really well - like this music." Real information about many of the early musicians is hard to come by, however. "It's sad that we only know a few of them. We know these because of a few old collectors passing through. We need more scholarship. It's an important part of our history." "I think the fiddlers' convention at Galax did a t lot to keep the music going ... and then the recordings started," says Morris. "That helped people take note of it and make people proud of the music. "The styles have changed. I don't think necessarily anybody plays like Emmett Lundy did. But they helped carry some of the tunes on. "I think the music has evolved. It's . similar, but people put their own individual things in it." "You know, the Galax sound has changed. There's an early Galax sound that had the British and the Scottish and the Irish influences." What's now known as old-time gradually evolved into bluegrass, although the two overf lapped mightily in Galax in the 1950s and '60s. Band music had "no breaks, but it had that rolling bluegrass banjo." The two genres began to separate in the 1970s, which Morris attributes to "some of the outsiders coming in here from New York." He says they helped regenerate old-time music back to its roots. Now musicians "go back and try to. capture some of the earlier styles. "This area's probably got more traditional musicians than anywhere in the world. You go to listing them and you can get hundreds of names. It's in people's DNA." 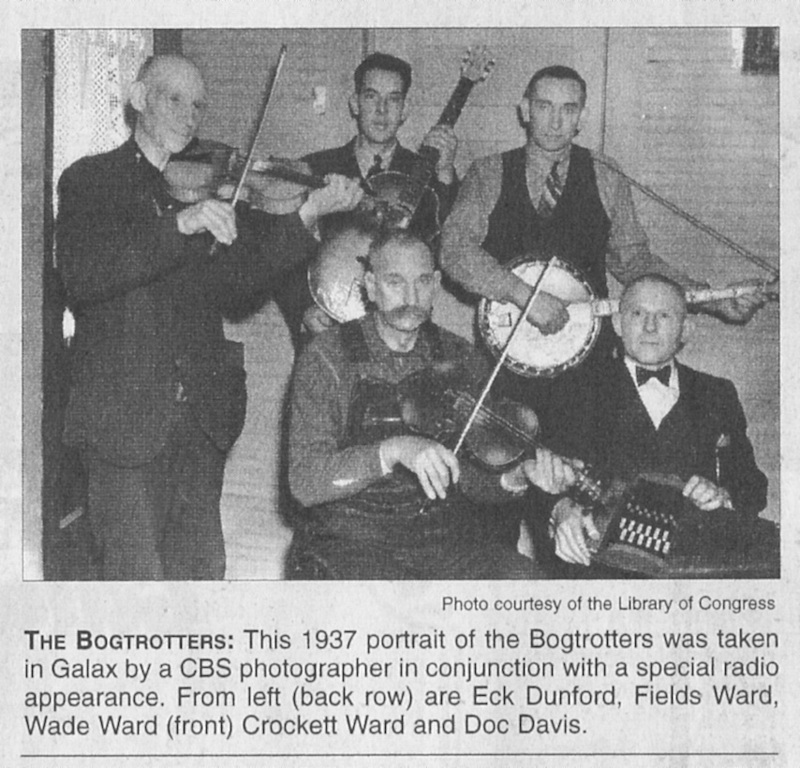 Photo courtesy of the Library of Congress THE BOGTROTTERS: This 1937 portrait of the Bogtrotters was taken in Galax by a CBS photographer in conjunction with a special radio appearance. From left (back row) are Eck Dunford, Fields Ward, Wade Ward (front) Crockett Ward and Doc Davis.